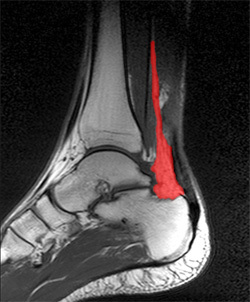 It is important to know that pain at the back of the heel is not always due to Achilles tendon rupture. It may be due to bursitis (fluid accumulation in the heel due to repeated irritation) and tendonitis (pain along the Achilles tendon due to constant friction and irritation). The above disorders tend to improve with use of pain medications and rest, whereas Achilles tendon rupture requires surgery and/or a cast.